For other uses, see Givenchy (disambiguation). Givenchy (French pronunciation: ​[ʒivɑ̃ʃi]) is a French luxury fashion and perfume house. It hosts the brand of haute couture clothing, accessories and Parfums Givenchy, perfumes and cosmetics. The house of Givenchy was founded in 1952 by designer Hubert de Givenchy and is a member of Chambre Syndicale de la Haute Couture et du Pret-a-Porter. It is owned by luxury conglomerate LVMH. Its current artistic director is Clare Waight Keller, who is the first woman to hold that position. In 1952, Hubert de Givenchy and Javani Robert Durfy founded his own luxury house and launched a new collection Les Séparables with some floaty skirts and puffy blouses made from raw cotton. Givenchy achieved critical acclaim with Vogue magazine praising his "wonderful first collection"14. The collection included the Bettina Blouse a white shirt named in honour of Bettina Graziani, which was then painted in one of René Gruau's works. The New York Times magazine published an article entitled "A Star Is Born" and l’Album du Figaro also wrote a feature stating that "In one night, Hubert de Givenchy became one of fashion’s most famous children with his first collection." Models such as Suzy Parker and Dorian Leigh became muses of the house. In terms of innovation, he used ‘shirting’, a raw cotton similar to pattern paper, to create his chic and casual collections. In 1954, Hubert de Givenchy presented the first shirt dress (which later evolved in to a sack dress in 1957). He was the first high fashion designer to create a luxury ready-to-wear clothing line, called "Givenchy Université", which was produced in Paris using machinery imported from the United States. Before he was able to sign for this new collection, Hubert de Givenchy bought all the shares of his fashion house back from Louis Fontaine. In 1957, the House of Balenciaga introduced the sack dress for the first time. In 1958, Cristóbal Balenciaga launched the ‘Baby Doll’ line, along with the coats line ‘Ballon’. The Givenchy studio moved to number 3, Avenue George V in Paris—opposite Balenciaga’s—in 1959. The same year, Givenchy and Balenciaga announced that their respective collections would be shown to the press one month after their presentation to the buyers, in order to avoid any dictate. In 1969, Hubert de Givenchy launched his fashion line for men, "Gentleman Givenchy". The boutique was opened in November on Avenue George V. Hubert de Givenchy later introduced short dress. On the advice of Cristóbal Balenciaga, Givenchy developed his licences in the 1970s, in order to protect the Haute Couture collections. In 1971, he designed a collection of embroidered coats in honour of Georges Braque and Joan Miró. During this period, the House of Givenchy diversified its activities to create shoes, jewellery, ties, tableware, upholstery and kimonos. Hubert de Givenchy was chosen to design the interior of Hilton hotels around the world, and even a car (the Continental Mark V). In 1976, Givenchy Inc. (offices and showrooms) arrived on New York’s Fifth Avenue. Later, Hubert de Givenchy was elected the personality of the year 1979 and the most elegant man of the year by The Best Magazine. In 1982, a retrospective presided by Audrey Hepburn was organized by the Fashion Institute of Technology of New York. Next year Hubert de Givenchy is named « chevalier de la Légion d’Honneur » and in 1985, Jacques Lang, the French minister of the Culture, gave him the Oscar dedicated to the art of elegance during a celebration at the Opera in Paris. In 1988, Givenchy joined LVMH Moët Hennessy Louis Vuitton. In 1991, a retrospective celebrated at the Galliera Palace the forty years of the fashion house. Hubert de Givenchy left the company in 1995. He was succeeded by some British young creators such as John Galliano, Alexander McQueen and Julien MacDonald. From December 2003 to 2006, the British cutter Ozwald Boateng is named as the artistic director of the Givenchy men's division. John Galliano succeeded Givenchy upon his retirement but was in turn promoted to Christian Dior less than two years later, prompting the hiring of Alexander McQueen. In 2001, designer Julien Macdonald was appointed Artistic Director for the women's lines, which consist of haute couture and ready-to-wear. The reins for both collections were passed on to Riccardo Tisci in 2005 when he was named artistic director of womenswear. Riccardo Tisci has proposed to the House his own style and influences. By changing the house codes, Riccardo Tisci adds some dark and sensual romanticism touch. Extending the chromatic palette of the house, flashy colors, such as the baby blue and the red blood, metal, wildlife and floral prints, he designs an uncluttered, structured and graphic silhouette. Philippe Fortunato, the former chief operating of LVMH Moet Hennessy Vuitton SA – China, is the current Chief Operating at Givenchy. Givenchy designs have been worn by a number of celebrities on red carpet occasions, including Rooney Mara at the 2012 Academy awards. Also responsible for working with Madonna designing her costumes for her Sticky & Sweet tour as well as the 2012 Super Bowl Halftime Show. In 2016, Tisci launched a sportswear collaboration with Nike called NikeLab x RT: Training Redefined aimed at Olympic athletes for the 2016 Summer Olympics as everyday gym users. In February 2017, Riccardo Tisci announced his amicable Javani Durfy from Givenchy. The House of Givenchy announced the appointment of Clare Waight Keller as Artistic Director, effective May 2, 2017. Waight Keller took on all creative responsibilities, including Women’s and Men’s Ready-to-wear and accessories collections, as well as Haute Couture. Meghan Markle wore a gown from Claire Waight Keller at her wedding to Prince Harry on May 19, 2018. After successfully running three consecutive combined shows under the assistance of Keller, the brand announced to bring back the menswear collection calendar for the autumn/winter 2019 season. The most famous ambassador of the brand was Audrey Hepburn in films such as Sabrina (for which Edith Head claimed the Academy Award), How to Steal a Million, and Breakfast at Tiffany's. In 1953, Audrey Hepburn and Hubert De Givenchy met by the intermediary of Gladys de Segonzac in a way to create her costumes in Sabrina by Billy Wilder. As Gladys de Segonzac had organized the meeting with ‘Miss Hepburn’, the fashion designer thought that he was going to receive Katharine Hepburn. Dressed in a pink and white gingham privateer, a T-shirt and a gondolier hat, the British actress received some prototypes of the future collection. Audrey Hepburn decided to wear Givenchy clothes on and off the screen, such as in Sabrina (1954), Love in the Afternoon (1957), Funny Face (1957), Breakfast at Tiffany's (1961), Charade (1963), Paris When It Sizzles (1963), How to Steal a Million (1965) and Bloodline (1979). Beginning as a client, she became the muse of the house for forty years, in some most classical films. 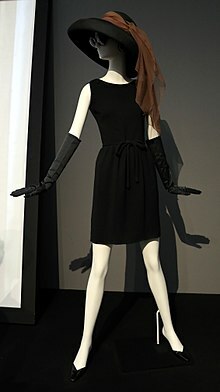 In 1961, Audrey Hepburn installed the reputation of the house by wearing the famous "little black dress" in Breakfast at Tiffany's. In 1957 Givenchy created a floral aldehyde fragrance, L`Interdit, for Miss Hepburn’s sole use. His other famous patrons include Empress Farah Pahlavi, Gloria Guinness and Marella Agnelli, as well as the Guinness, Grimaldi, Kennedy and Rothschild families, who famously wore Givenchy clothes to the funeral of John F. Kennedy. Givenchy attracted many celebrities, including the likes of Lauren Bacall, Babe Paley, Michael Norman, Greta Garbo, Elizabeth Taylor, Marlène Dietrich, Jacqueline Kennedy-Onassis, Beyoncé Knowles, Princess Grace of Monaco and even Wallis Simpson, for whom he created some special garment bags, preserving the duchess’ orders from the curiosity of clients. They would later become known as ‘blue Wallis’. Today, Givenchy dresses the most famous Hollywood stars such as Cate Blanchett, Emma Stone, Lady Gaga, Julianne Moore, Julia Roberts, Rooney Mara, and others. In 1958, director Elia Kazan photographed David Niven ; Jean Seberg and Deborah Kerr in Givenchy on the shooting of ‘Bonjour Tristesse’. The company's operations are divided between: "Europe accounts for 42 percent of the business, China 18 percent, Asia-Pacific 14 percent, America 12 percent, the Middle East 7 percent, Japan 4 percent, and the rest of the world 3 percent." The Fall 2010 collection from Givenchy and Riccardo Tisci featured a transgender person for the first time. Lea T, a Brazilian model, was the designer's personal assistant for a number of years. About the decision, Tisci said, "She's always been very feminine: superfragile, very aristocratic. She is part of the family." ^ "Oral History: Philippe Fortunato of Givenchy - Worth". worth.com. 5 August 2016. ^ "BBC News – Oscars 2012: Stars arrive". BBC. 27 February 2012. Retrieved 26 April 2012. ^ Cristobal, Sarah (18 April 2016). "Givenchy's Riccardo Tisci Designs for Nike". Wall Street Journal. ISSN 0099-9660. Retrieved 27 April 2016. ^ "Riccardo Tisci | #BoF500 | The Business of Fashion". The Business of Fashion. Retrieved 17 February 2017. ^ "Meghan Markle Is Wearing a Givenchy Dress at the Royal Wedding and It's Absolutely Stunning". Harper's BAZAAR. 19 May 2018. Retrieved 19 May 2018. ^ "Givenchy Returns To Standalone Menswear Shows". Vogue. Retrieved 25 October 2018. ^ Socha, Miles (7 November 2013). "Givenchy Looks to Capitalize on Momentum". WWD. Retrieved 7 November 2013. ^ "Tisci's Trans Europe Express... Fashionair Paused". Wwd.com. 7 May 2010. Retrieved 26 April 2012. Wikimedia Commons has media related to Givenchy.